This is our take on Traditional Pad Thai noodles, which we made several times throughout our travels in Thailand. 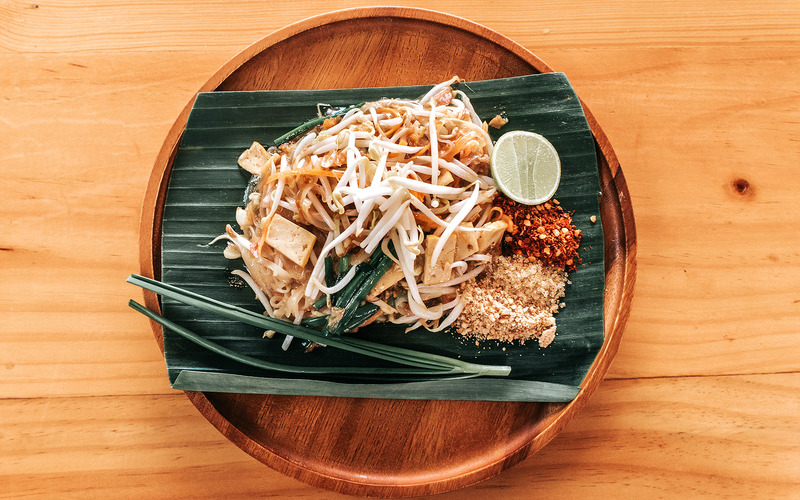 Although we have an ‘Easy’ Pad Thai version on our website using ingredients more readily available in the U.S., this recipe calls for traditional Asian ingredients. It’s a great way to learn more about Thai ingredients, check out your local Asian market, and step outside of your comfort zone in the kitchen. The result is amazing! 1/2 block firm tofu or 7 oz. While the noodles are soaking, combine the sauce ingredients (tamarind, palm sugar, salt and water) in a small bowl and mix well. Set aside. See notes below for breaking down palm sugar easily. Next, prep your ingredients. Thinly slice the garlic and shallots and set aside. Chop the sweet pickled radish and set aside. Chop the green onions into 1-inch pieces and set aside with the mung bean sprouts. Slice your tofu into 1-inch cubes and set aside. Crush or chop your peanuts and set aside with the red chili flakes. Heat your wok to medium-high. Once it is hot, add 1-2 tbsp of oil to the wok. Once the oil is hot (about 15-30 seconds), add in your garlic and shallots. Cook those until they are fragrant, about 30 seconds. Add in the cubed tofu and pickled radish and cook until the tofu it is browned, about 4-5 minutes. Your Pad Thai is ready! Put the Pad Thai onto plates, and serve with extra chives, sprouts, peanuts and chili flakes. Quarter the lime and add a slice to each plate for an option to squeeze onto the Pad Thai. Enjoy!